Last night superstar Rihanna celebrated a major milestone for her beauty company as Fenty Beauty turned one. Not only is Rihanna a talented singer, the Barbadian singer is also a successful entrepreneur. Fenty Beauty is a cosmetics brand launched in September 2017. Popular for its broad inclusivity across skin tones and gender, especially its Pro Filt’R foundation product produced in 40 different shades, Fenty Beauty was named one of Time magazine’s best inventions of 2017. 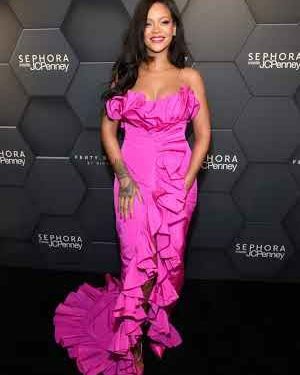 The anniversary party for Fenty Beauty was held on Friday night (September 14) at Sephora in JCPenney at Kings Plaza mall in Brooklyn, New York. The 30-year-old entertainer stepped out in a vibrant Calvin Klein By Appointment dress. Will Rihanna Perform at the Super Bowl and Grammys? ?